Industrial forestry typically leads to a simplified forest structure and altered species composition. Retention of trees at harvest was introduced about 25�years ago to mitigate negative impacts on biodiversity, mainly from clearcutting, and is now widely practiced in boreal and temperate regions. Despite numerous studies on response of flora and fauna to retention, no comprehensive review has summarized its effects on biodiversity in comparison to clearcuts as well as un-harvested forests. 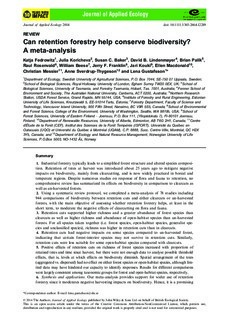 Using a systematic review protocol, we completed a meta-analysis of 78 studies including 944 comparisons of biodiversity between retention cuts and either clearcuts or un-harvested forests, with the main objective of assessing whether retention forestry helps, at least in the short term, to moderate the negative effects of clearcutting on flora and fauna. Retention cuts supported higher richness and a greater abundance of forest species than clearcuts as well as higher richness and abundance of open-habitat species than un-harvested forests. For all species taken together (i.e. forest species, open-habitat species, generalist species and unclassified species), richness was higher in retention cuts than in clearcuts. Retention cuts had negative impacts on some species compared to un-harvested forest, indicating that certain forest-interior species may not survive in retention cuts. Similarly, retention cuts were less suitable for some open-habitat species compared with clearcuts. Positive effects of retention cuts on richness of forest species increased with proportion of retained trees and time since harvest, but there were not enough data to analyse possible threshold effects, that is, levels at which effects on biodiversity diminish. Spatial arrangement of the trees (aggregated vs. dispersed) had no effect on either forest species or open-habitat species, although limited data may have hindered our capacity to identify responses. Results for different comparisons were largely consistent among taxonomic groups for forest and open-habitat species, respectively. Synthesis and applications. Our meta-analysis provides support for wider use of retention forestry since it moderates negative harvesting impacts on biodiversity. Hence, it is a promising approach for integrating biodiversity conservation and production forestry, although identifying optimal solutions between these two goals may need further attention. Nevertheless, retention forestry will not substitute for conservation actions targeting certain highly specialized species associated with forest-interior or open-habitat conditions.